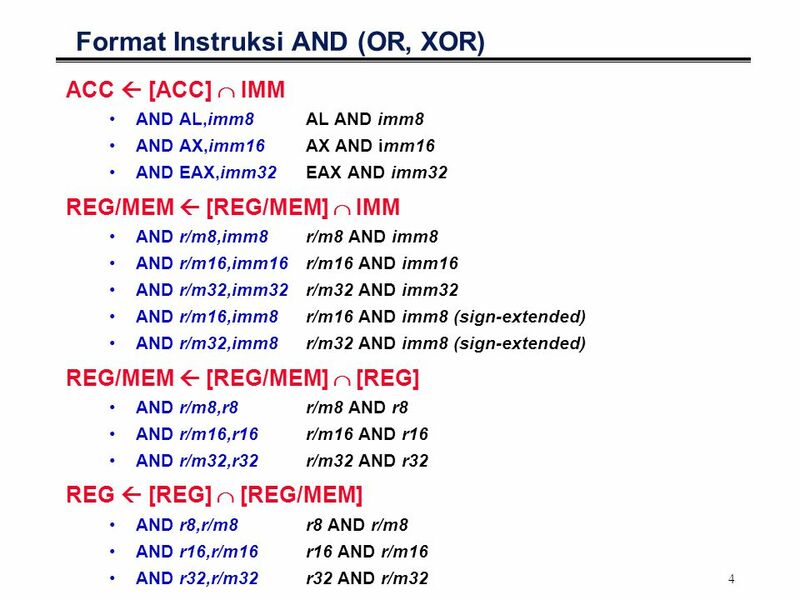 2 2 Logical Instructions °The logical instructions AND, OR, XOR (exclusive or), and NOT perform the standard Boolean operations for which they are named. 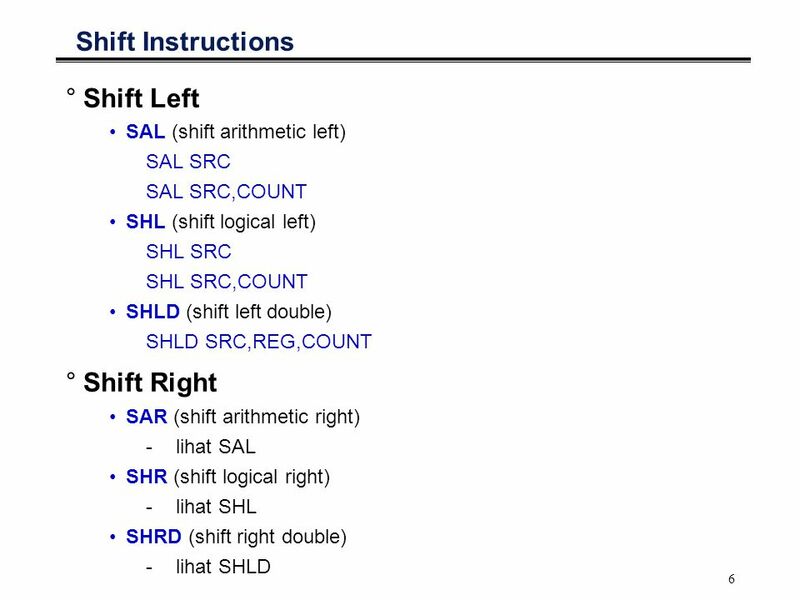 OF and CF flags are cleared; SF, ZF, and PF flags are set according to the result; AF flag is undefined (AND/OR/XOR) °The shift instructions rearrange the bits within an operand. 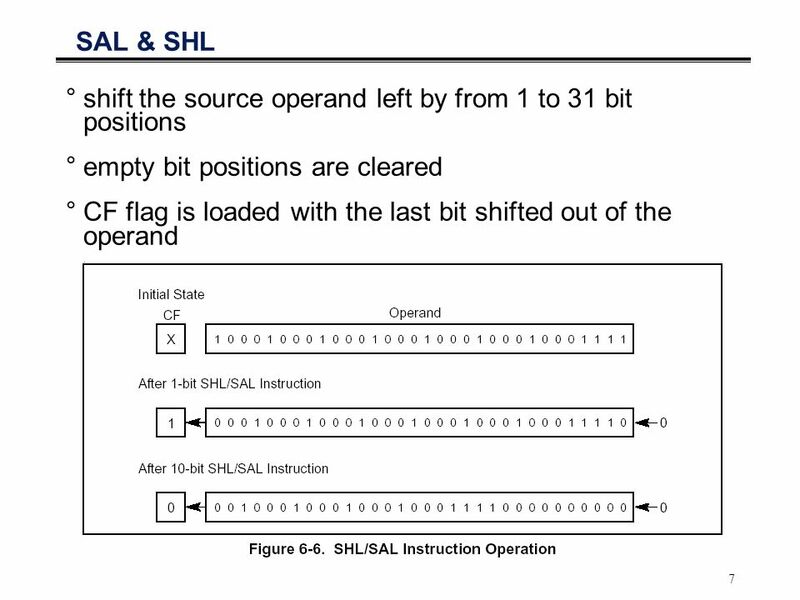 CF flag contains the value of the last bit shifted out of the destination operand; it is undefined for SHL and SHR instructions where the count is greater than or equal to the size (in bits) of the destination operand. 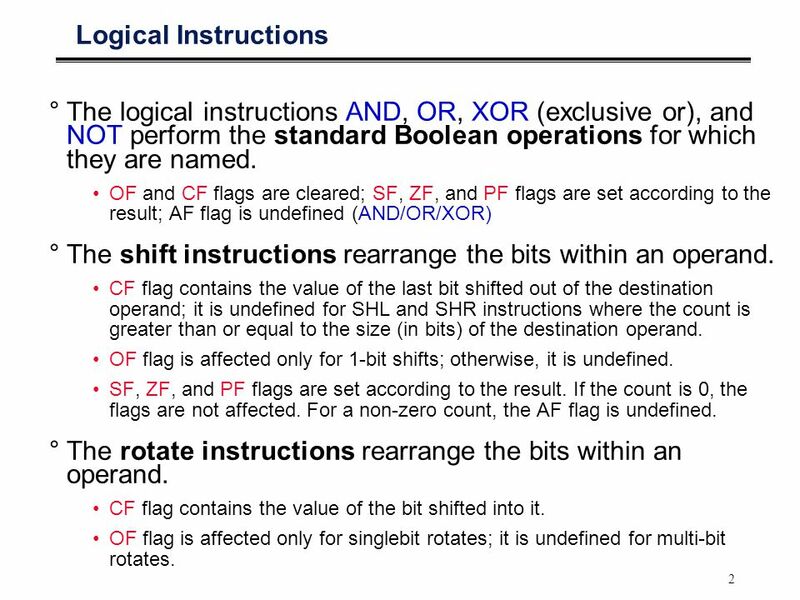 OF flag is affected only for 1-bit shifts; otherwise, it is undefined. SF, ZF, and PF flags are set according to the result. If the count is 0, the flags are not affected. For a non-zero count, the AF flag is undefined. 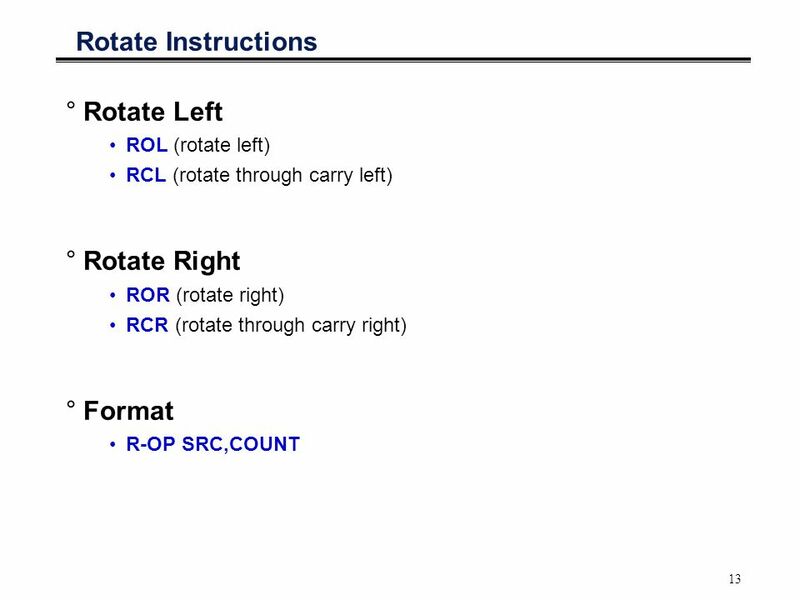 °The rotate instructions rearrange the bits within an operand. 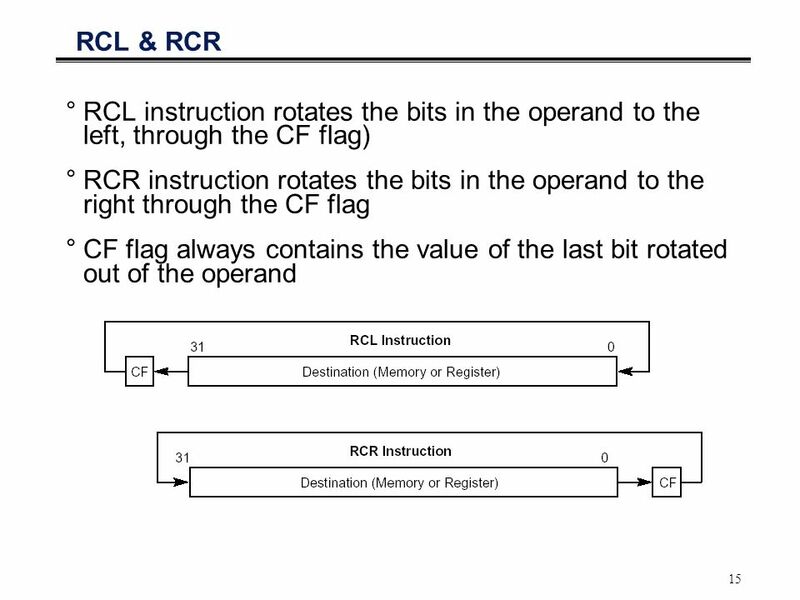 CF flag contains the value of the bit shifted into it. 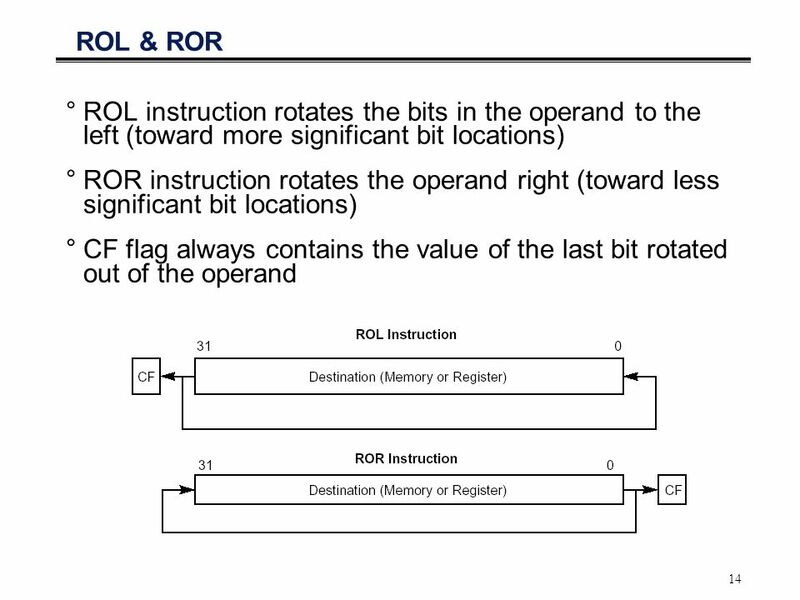 OF flag is affected only for singlebit rotates; it is undefined for multi-bit rotates. Download ppt "1 IKI10230 Pengantar Organisasi Komputer Kuliah no. 05.c: Logical Operations Sumber: 1. Paul Carter, PC Assembly Language 2. Hamacher. 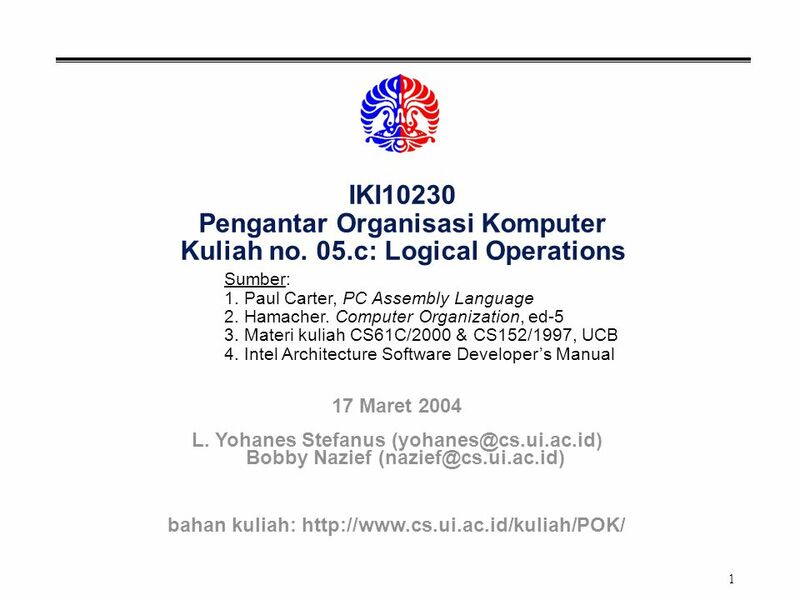 Computer Organization,"
1 IKI10230 Pengantar Organisasi Komputer Kuliah no. 05.a: Data Transfer Instructions Sumber: 1. Paul Carter, PC Assembly Language 2. Hamacher. Computer. NEG Instruction Change operand content into two’s complement (negative value) and stored back into its operand mov bl, b neg bl; bl = mov. 1 IKI10230 Pengantar Organisasi Komputer Kuliah no. 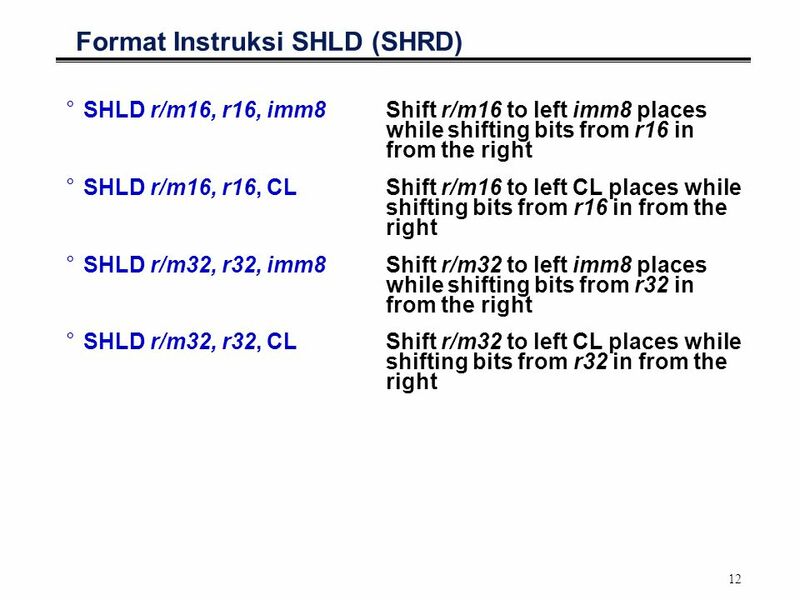 11: Control Unit Sumber: 1. Paul Carter, PC Assembly Language 2. Hamacher. Computer Organization, ed-5. 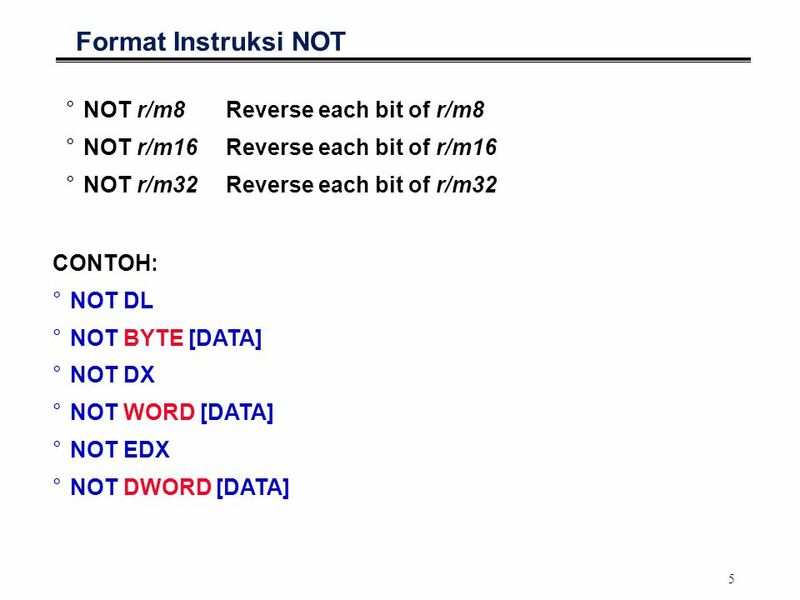 80x86 Instruction Set Dr. Qiang Lin. 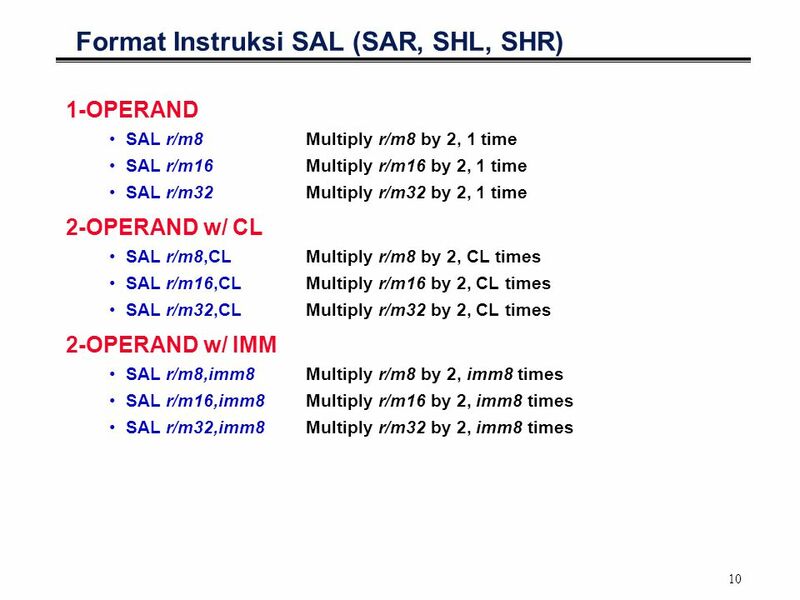 1 Lecture 7 Integer Arithmetic Assembly Language for Intel-Based Computers, 4th edition Kip R. Irvine. 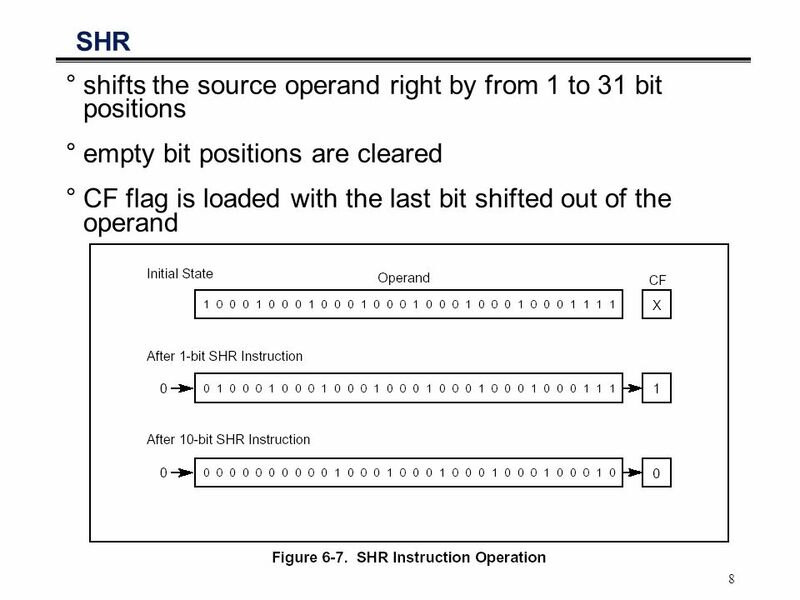 Chapter 8 Bit Manipulation Contents: Logical Operations Shift and Rotate Instructions. 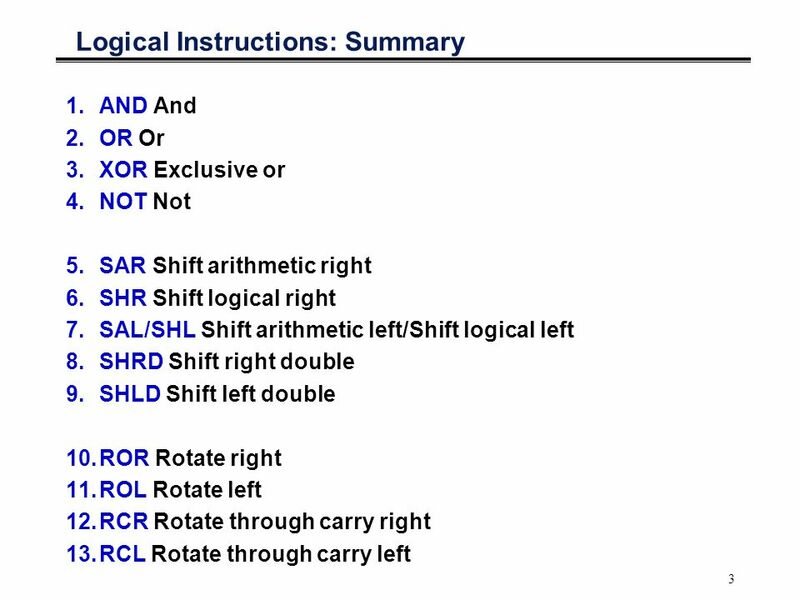 Logical, Shift, and Rotate Operations CS208. 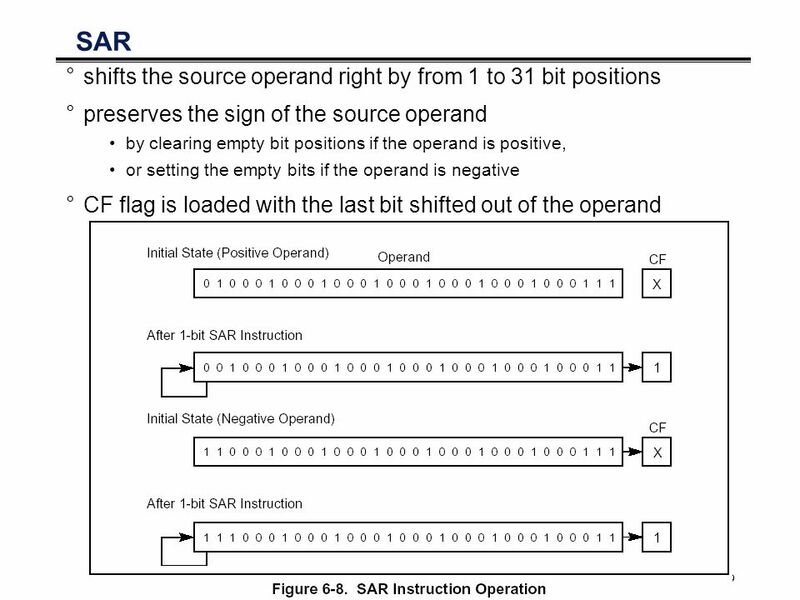 Logical, Shift and Rotate Operations  A particular bit, or set of bits, within the byte can be set to 1. Assembly Language for Intel-Based Computers, 4 th Edition Chapter 7: Integer Arithmetic (c) Pearson Education, All rights reserved. You may modify. 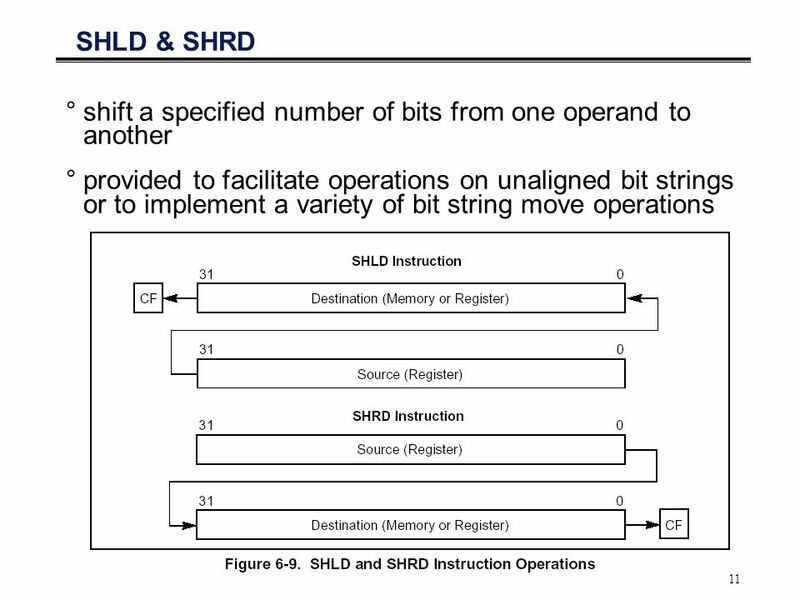 Logical and Shift operations A particular bit, or set of bits, within the byte is set to 1 or 0 depending on conditions encountered during the execution. © 2006 Pearson Education, Upper Saddle River, NJ All Rights Reserved.Brey: The Intel Microprocessors, 7e Chapter 5 Arithmetic and Logic Instructions. 9-1 ECE 424 Design of Microprocessor-Based Systems Haibo Wang ECE Department Southern Illinois University Carbondale, IL x86 Instructions Part. 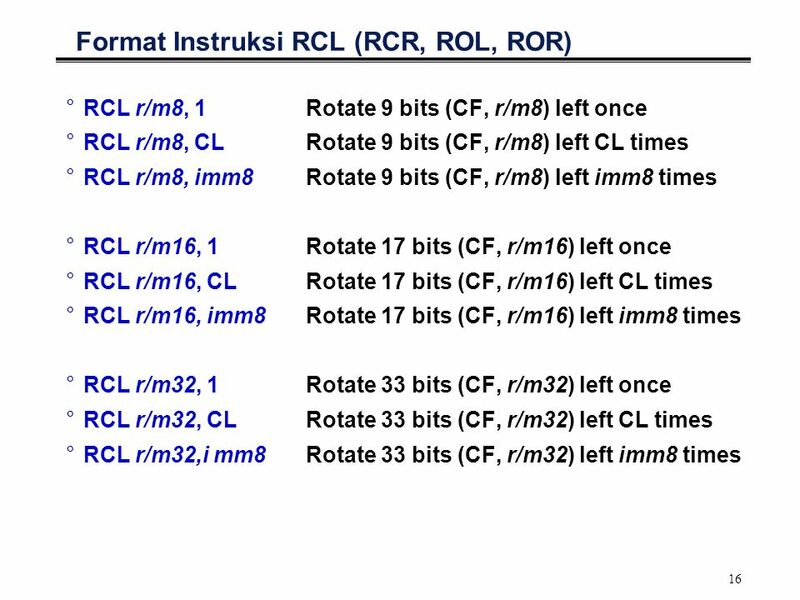 Assembly Language for Intel-Based Computers, 5 th Edition Chapter 7: Integer Arithmetic (c) Pearson Education, All rights reserved. You may. Practical Session 2. Labels Definition valid characters in labels are: letters, numbers, _, $, ~,., and ? first character can be: letter, _, ? and. Chapter 7 Bit Manipulation. 7.1 Logical Operations.